This section includes general questions about managing accounts, using Mystery Science, and buying memberships. For technical troubleshooting, check out the tech support page. If you can’t find an answer, click the Ask Anything button above. If you’re logged out, click on the “don’t know your password” grey link under the login window. You’ll receive a password reset link via email. Or click here to reset your password now. How do I join my school’s/district’s membership? After your school or district purchases a membership, we’ll send your administrator a join link by email. Please contact your school’s or district’s administrator, who can share the join link with you. Or your colleague can invite you to join the membership by clicking on “Invite more” in their account settings. If you have any trouble accessing your organization’s membership, please contact us. How can I unlock the other mini-lessons? Each week we release a new mini-lesson which is available for that week to everyone with a Mystery Science account. After a week, the mini-lessons are added to the locked archive. To unlock the archive and access prior mini-lessons, you’ll either need a paid Mystery Science membership or you can invite 5 friends to join Mystery Science. To invite friends, click on your name in the top right corner of your Mystery Science homepage. You will see a drop-down menu. Click the "Share with friends" option, and a pop-up window will appear. There, you can share Mystery Science with friends and colleagues. How do I invite teachers to our membership? Click on your name in the top right corner when you’re logged into your Mystery Science account. This takes you to the school dashboard. Click on the “Invite more” button at the top right of this screen. 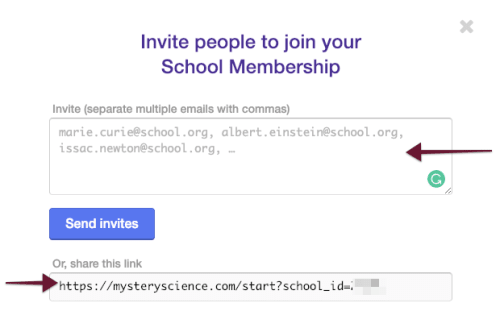 You can invite additional teachers at your school on the screen that pops up, or copy-paste the join link and share it via email. How do I remove teachers from our membership? This takes you to the school dashboard. Click on the “Manage Teachers” tab at the top of the dashboard. 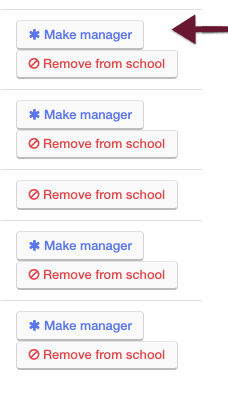 On this page, you can promote other users to manager status or remove users from your school. If you need to be added as a manager at your school, please contact us and we will edit your account for you. How do I submit a student science question? You can submit student science questions here: mysteryscience.com/ask, Or just click on the Ask Anything link at the top of your screen when you’re logged in. Do you have a planning guide that aligns Mystery Science with the Next Generation Science Standards (NGSS) or my own state’s standards? Mystery Science is aligned to the Next Generation Science Standards. Each Mystery is aligned to a topic, performance expectations, science and engineering practices, disciplinary core ideas, and crosscutting concepts. This pacing guide is a resource to support your year-long planning. It contains a one-page overview of the units for each grade and the Mysteries in each unit. For each unit, a one-pager shows the alignment to the Next Generation Science Standards. The units can be taught in any order. In most units, the Mysteries build on one another, therefore, we strongly recommend teaching the Mysteries within each unit in the sequence they are presented. If you have more time, each unit can be extended by using items from the Optional Extras. We also provide crosswalks for several state standards; more are on the way! Our Mysteries involve hands-on supplies that are common and/or easy to get (e.g., Ziploc bags, paper cups, paper clips, etc.) You can find a list of supplies for each Mystery using the “View activity supplies” button above the “Start Mystery” button. To find a list of supplies for each unit, open the unit and at the top you’ll see the “Activity Prep” tab. You can also create a master supply list organized by Mystery, unit, classroom, or grade using our supply calculator. Please contact us if you have questions about our supplies. Do you offer Spanish language support? Student worksheets and assessments are available in Spanish. Just click on the “View Spanish” button at the top right of the worksheet to toggle between English and Spanish versions. If the Spanish version doesn’t come up, this means it’s in the process of being translated. We are also working on providing video transcripts in Spanish, and expect to have those available by March 2019. What is the Anchor Layer or unit starter, and how do I turn it on? The Anchor Layer enhances the Mystery Science curriculum with anchoring phenomena, student-driven inquiry, opportunities for students to develop and revise their ideas throughout the unit, and performance tasks. The Anchor Layer is currently available for 4th- and 5th-grade units. It is recommended for teachers who are very familiar with Mystery Science and have more than an hour allotted for science each week. Click on your name in the top right corner when you're logged into your Mystery Science account. On the drop-down menu, click "Account Settings". On the Account Settings page, you can turn the Anchor Layer on, then click "Save". The Anchor Layer is available for all Mystery Science paid memberships and free trials. Do you offer lessons for middle school/junior high? Mystery Science is an NGSS aligned K-5 curriculum, and we don’t have any immediate plans to expand into a middle school curriculum or beyond. That said, many teachers and homeschool parents use Mystery Science with their older students as a review for previously taught subjects or as a springboard to more complex topics. Can students access Mystery Science? We do not offer accounts for students, nor do we store any student-specific information. You can, however, share individual Mysteries with students to work on at home. Just click on the “Student link” at the top right of a Mystery’s main page. This link gives students access to a version of the Mystery but does not require students to create accounts. Buying Mystery Science is easy! Our process is self-service. Just visit the order page when you are logged into your account, and follow the step-by-step instructions. If you don't have an account with us yet, you can create a quote on the pricing page. Once you have created a quote, you can pay via credit card, check, or purchase order. Classroom and Homeschool Memberships can also be purchased using PayPal. What membership should I buy if I am a science specialist, librarian, special ed teacher teaching multiple classrooms, or teacher at a virtual school? Science specialist for one grade. If you teach science in multiple classrooms in one grade, you can use a Classroom Membership. Science specialist for multiple grades. If you are teaching in multiple classrooms across multiple grades, your school will need to sign up for a School Membership. Special education or resource teachers. You can sign up for a Classroom Membership and use it with up to 35 students you support. If you support more than 35 students, your school needs to buy a School Membership. If you want to assign individual Mysteries to students using the student link, you can purchase a Classroom Membership. Students will be able to access the Mysteries in student mode. If you want families to be able to navigate the site, picking and choosing which Mysteries they use, each family will need their own Homeschool Membership. Can’t find your role? Contact us and we’ll figure it out together! How do I create a price quote? You can create a price quote on the order page if you are logged into a Mystery Science account that is eligible for a new order or renewal. Or, if you don't have an account with us yet, you can create a quote on the pricing page . 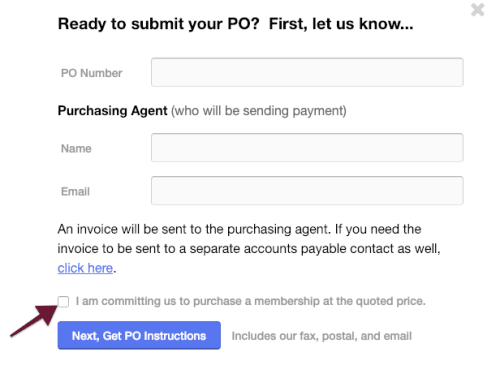 Click the “Submit a purchase order” button at the top of your quote. Enter your PO number, as well as the name and email address of your Purchasing Agent (the person at your school or district who is responsible for payment). You will then see an invoice with instructions on where to email (preferred), fax, or mail your purchase order. If a quote was emailed to you, click the link in your email to open the quote. If you have a printed quote, you can view the online quote by going to the URL listed on the printed quote. It will have the format of www.mysteryscience.com/order/#######. If you need to create a new quote, go to the order page (if logged in) or to the pricing page (if not logged in). We accept online payment via credit card. You can also submit a purchase order and pay the invoice via check or credit card. The W-9 form is attached to your quote. You can also access it directly here: mysteryscience.com/w9. Do you offer any discounts or other incentives? Each spring and back-to-school/August, we offer discounts on Homeschool Memberships. If your school is small (less than 100 students in K-5), we offer a small school discount. Please create a school quote and contact us with the quote number and the count of K-5 students at your school to request a small school discount. We do offer bulk discounts if a minimum of 100 homeschool families purchase together with one order. We only accept group buy purchases during the months of January, February, and March. Please contact us for details! We don’t want funding to be an obstacle to using Mystery Science! If your school cannot afford a Mystery Science membership, please contact us. We’ll be happy to connect with your school administrator so we can find a way for your school to continue using Mystery Science.